Hydrothotics are fluid filled with a vegetable based food-grade glycerin, they provide relief for pain in your feet, heels, ankles, knees, hips and lower back. 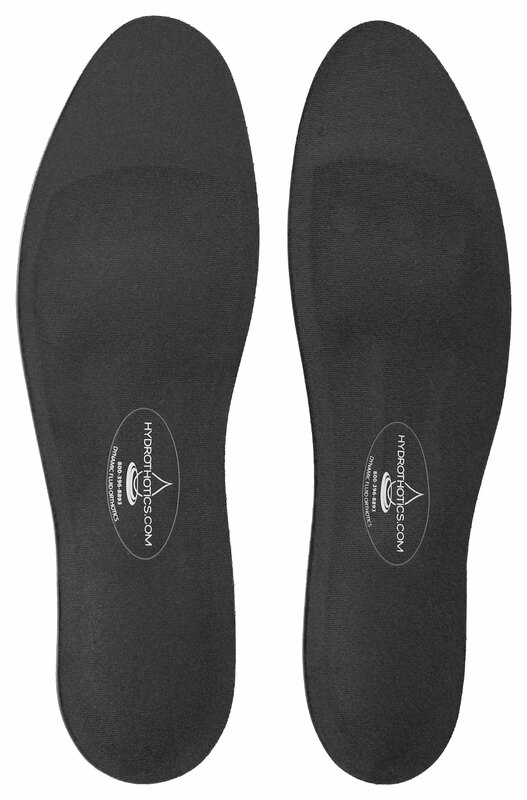 The fluid provides you with custom arch support, cushioning and massage for your feet to relieve pain and increase blood flow in your lower extremities. They are clinically proven to reduce pain and increase circulation. They are also effective in reducing pain from more serious conditions such as Plantar Fasciitis, Morton’s Neuroma and Diabetic Neuropathy. Hydrothotics are easily sized to fit your shoes by simply trimming the toe end of the Hydrothotics with a pair of scissors. They are made of the highest quality materials and are warranted for one year from date of purchase. The blue cloth top layer acts as a moisture barrier to keep your feet cool and comfortable. The top layer is anti-microbial treated to resist odor and mildew. Maintenance is easy too, just hand or machine wash for longer life. They are thin and should not alter the fit of your shoes.